Positive Deviant Leadership: A Problem To Solve Or A Problem To Manage? Imagine a couple of famished vultures musing over their dead friend’s body. 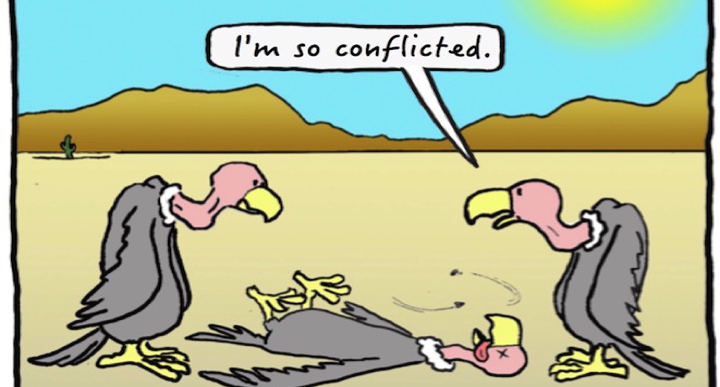 One vulture is visibly conflicted. He wishes he could bring back his friend, yet for completely selfish reasons is keen to get over his loss. He is conflicted with thoughts of wanting to give his buddy a respectable send off on the one hand and thoughts of devouring his carcass on the other. Vultures in such a situation might comfort themselves with Rienhold Niebuhr’s serenity prayer. Experience has taught me that knowing the difference between what you can change and what you can’t, can save a tremendous amount of time, effort and anxiety. Just as important, is knowing the difference between problems to be solved and problems to be managed. Successful leaders are able to make this important distinction. Traditional problem-solving approaches is fine where the problem at hand has a definite answer such as to the square root of 749.3 is 27.37. We’re schooled to solve problems with ‘either or’, ‘right or wrong’, ‘black or white’ thinking. But what about when things are a bit more grey? For example, have you ever felt pulled between loyalty to your Team and loyalty to your Organisation? There might be good reasons for the proposed cutbacks but you’re the one who’s going to have to break the difficult news to people who have been faithfully been working for you. I’ve been in this situation and it’s not easy; you find yourself flipping between the two positions team and organisation. It’s frustrating, especially when your best efforts to handle the situation aren’t enough to assuage that piggy in the middle feeling. What we’re experiencing in a situation like this are the effects of handling unsolvable problems, sometimes referred to as being a wicked problem. We can never get rid of the tension between team needs and organisational needs. This is because there are two opposing but interdependent positions at work here. Such a problem is referred to by Dr Barry Johnson (Polarity Management, 1992) as a polarity. Each position in a polarity has its own upside and downside. It’s important to remember that neither position in a polarity is wrong. Overplaying one position, however, can bubble up its downsides. This creates a tension, which results in flipping to the upside of the opposite position. But be careful!! Overplaying this new side of the polarity could also result in the bubbling up of its downsides forcing a shift back to the original position. And on and on it goes. 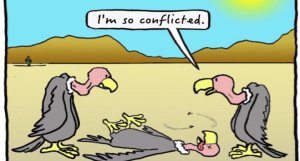 Just like the hungry vultures musing over their dead friend’s body, we’re constantly being conflicted by polarities especially in the workplace. Rather than uncontrollably lurching between the 2 sides of the polarity, a skilled leader is able to ask the question ‘how do we deliver the upsides of both positions at the same time?’ By mapping out the up sides and down sides for each position we’re able to understand the interplay between them and the signals warning us when one position is being overplayed. Great leaders masterfully manage the tension between both positions know when they’re getting too much of one side of the polarity and when its time to bring in more of the upside of the other. They are able to make adjustments to organisational systems, processes, culture, structure, and capability to manage the tensions in the best way. Bringing the opposite positions together in this way can be a great source of problem solving, innovation and approach for managing conflict. On the other hand, seeing everything as a problem to be solved, can be limiting. Such thinking focuses on solutions for one-half of the polarity, completely ignoring the other half. It’s as clumsy as a man with a hammer who goes ‘round treating everything as a nail. Inevitably he ends up doing more harm than good. In closing, allow me to finish off with my own tweak of Rienhold Nuiebuger’s serenity prayer. I hope this will help you as you take on the polarities of your workplace. What problems are you trying to solve that don’t seem to be responding to your best efforts currently? Might you be facing a problem to be managed rather than a problem to be solved? Have you considered mapping out the polarities and work out how you get the upsides of both? Fig 3.0 Workplace Polarities. See if you recognise any of these. Blog contributed by Tony Belgrave, Associate Consultant, ChangePace Consulting Ltd.